American contractor who spent five years in a Cuban jail reaches settlement with US government over his ordeal. 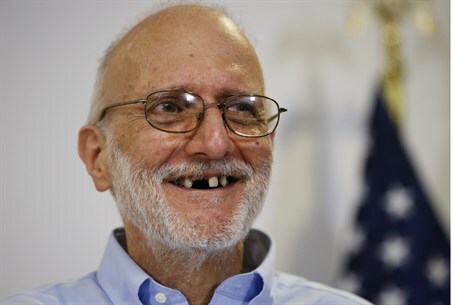 Alan Gross, the American freed last week after five years in a Cuban jail, has reached a $3.2 million settlement with the US government, media reports said Wednesday. The US government office he was doing work for in Cuba, the Agency for International Development, released a statement Tuesday confirming that a settlement had been reached, without disclosing the amount. The firm Gross worked for directly, Development Alternatives, was also a party to the agreement, USAID said. "The settlement, agreed in principle in November, calls for payment by USAID for unanticipated claims under the cost-reimbursement contract, including claims related to Mr. Alan Gross," the agency said. "The settlement avoids the cost, delay and risks of further proceedings, and does not constitute an admission of liability by either party." NBC News reported that the $3.2-million payment came as settlement of a larger contractual claim for $7 million filed by DAI against USAID for incurred expenses related to the arrest and incarceration of Gross. It said the settlement was finalized on Monday. Gross, 65, a foreign aid subcontractor, was delivering electronics to Jewish groups when he was arrested in Havana in December 2009. Initially accused of espionage, he was put on trial by Havana in 2011 and sentenced to 15 years behind bars for committing "acts against the independence and territorial integrity" of Cuba. He was released in a series of surprise moves last week that saw the United States announce that it would end 50 years of estrangement and normalize relations with Cuba. Gross arrived in Washington on a US military aircraft a week ago, accompanied by several US politicians. A specialist in satellite communications, he visited Cuba several times, delivering computer and satellite gear to the island nation's small Jewish community. At the time of his arrest, he was allegedly in possession of an electronic chip that prevents the location of satellite telephone calls to be traced.